I had a pretty amazing day of learning about baking yesterday. I ran into challenges with a new recipe and was able to brainstorm with John some solutions, and also realized that I don't allow myself any time to practice. Practice is important in any art form, and I have been wrong to ignore it in my baking. I've previously blogged about trying a new recipe and having an unrealistic expectation that it should turn out perfectly. I'm doing much better about that, as yesterday things did not turn out perfectly, but I didn't get disappointed - instead I learned! YAY! The main point I finally learned/understood was that if I want to try a new recipe, I DON'T have to wait for an event to try it. If it is just a plain old Tuesday and I really want to bake that treat I've watched 3 tutorials about on YouTube, I can just bake it. I was holding myself back from doing that as I didn't want to have lots of baked goods and no one to eat them (but me!). John reminded me that his sister is back in town (and loves treats! ), and we have friends in town that are always appreciative of a baked good delivery. So the new plan is to bake as desired; no event needed. Now I have the freedom to practice the art that is baking, and also try new things without having to wait weeks or months for an event. This way I won't get overly excited for the awesome result, which is part of what happened yesterday. 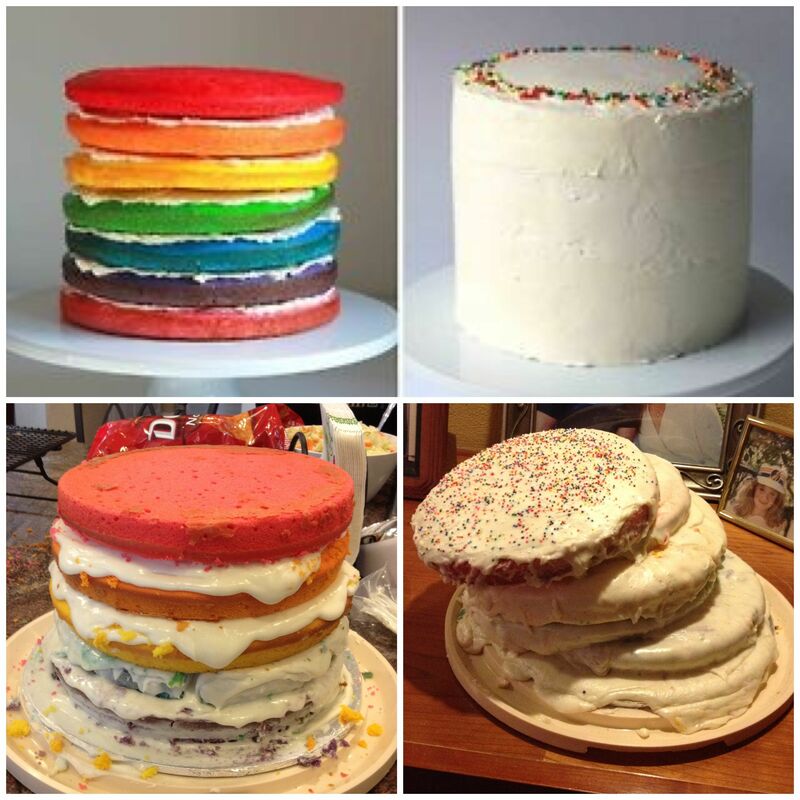 For about four months I've really wanted to make a rainbow cake, but never had the right event for it (it is a pretty large cake, so many guests seemed necessary). 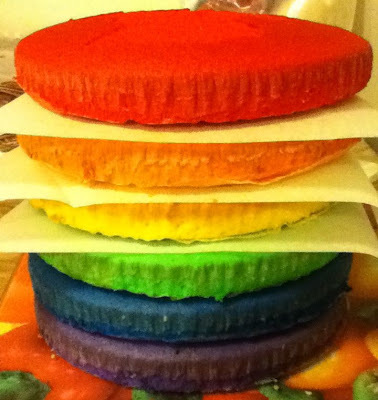 This is Birthday Week for me, so for a big turkey dinner at Mom's this afternoon, I offered to bring a rainbow cake. I decided to make the cake parts yesterday and then I would ice it today. But if only it were as easy as just baking and icing! If I could turn back time (more than just an hour! ), I would make a no pressure practice cake and learn from the challenges that came up. One such challenge was my excitement of what it would look like once complete, which led to me stacking the pieces together when the cake had cooled. I put parchment paper between the pieces to protect them, but unfortunately it didn't prevent each layer from ripping a giant hole out of the layer under it (the green layer ended up in three pieces). If it was a practice cake, I would have noted not to do that next time. LOL. But how could I resist? These were begging to be stacked! Baking this cake was not a problem, but assembling it was challenging, especially since I gave myself the extra task of having to transport it in a car for 35 minutes. And it is far too tall for a cake carrier (about 7.5 inches tall). I also had a concern that it would slide into pieces while being transported (based on this photo from the internet), the liklihood of which I would have known for sure if I had made it before. Making a six-tier cake might have been a tad ambitious, based on the fact that the most tiers I've ever made before was two. Trying to fix some of the broken pieces last night, I did a crumb coating of icing between a few of the layers as a way of encouraging them to stay intact. They held up overnight, and seem pretty solid, so I'm toying with the idea of transporting a finished cake. I was going to put it together at Mom's, as to avoid transporting a 7.5" high cake (with no cake carrier), but it looks like it just may hold together. I think I can find a box to transport it in too. But if it slides all to pieces in the car...well, I will know for next time! This is good. This is how we learn. I agree. Very happy it happened this way.